Everyone on the internet says if you want to reap high profits you should develop/create eBooks like how to guides and other information products. Ok, but how? How to do you create an eBook that actually sells? Internet publishing has become an industry. Internet publishers, most of them are one or two people working together to create eBooks on the market-driven topics and earn USD 30000 approximate profit on a monthly basis. In fact, your earning from an eBook depends upon choosing the right topic for the eBook according to the market. When you buy selling rights (resale rights) or write a book (you can start writing an eBook from a scratch or rewrite an eBook from a book with private label rights), the most crucial factor you have to consider is the demand of the product. It is a simple demand and supply theory from your Economics Class. Always ask this question before creating an eBook – Do people want your product? It’s simply stupid to waste a month time preparing / creating a product, making the website and setting up required sales techniques only to find that people don’t even flick an eyebrow at your product. 1 – Just ask in bulletin boards (forums) related to your niche. 2 – Hold a survey or public poll. 3 – Use keyword tools to see what kind of searches people are doing.etc. The internet is a flat playing field, and you’ve the power to reach almost anybody anywhere in the world with an Internet connection. Learning how to create an eBook doesn’t need to be hard. Here are five simple steps you can follow to make your eBook. The first step in learning how to create an eBook is to target your audience. Who is your niche? Who is your market? Before you create an eBook you need to answer these questions. For some people, deciding what to write is the hard part, but it doesn’t have to be. Think about hobbies, both your own and others, as well as what problems other people have. What do you know that could help people solve problems? People are always looking for advice on how to make money and how to save money. Could you write a guide telling them how to make money from their hobbies? Chances are you won’t be able to sit down and create an eBook from the top of your head. Even if it’s a topic you’re familiar with, you’ll want to research and plan before you get started. One simple way to do this is to write down the questions that your market has about the subject. You might want to read forums where they hang out and read the same magazines they read. Now that you have your questions, you can write your eBook. It doesn’t matter whether or not you consider yourself a great writer. You do not have to write 100-plus pages and you don’t need to write perfect prose. Simply answer the questions the same way you would if you were writing a letter with advice to your friend. Let your personality shine through. If you aren’t an expert in the subject, consider finding someone who is and interview them for your guide. This is a great way to create an eBook on any subject. Now that you have your eBook written, let a few friends read it. Proofread it, but don’t worry about catching every mistake. Even published books may have errors. Once you’re happy with the product, it’s time to convert it into PDF. There are some programs that will do this free with just a click of the button. One choice you have is Open Office, which is a free program similar to Microsoft Office. You can convert Open Office writer documents into PDFs in one step. Whether you plan to sell your eBook or give it away for free, you need to upload it onto your website so that you can share it with others. You’ll need a website host an FTP program. There are many hosts to choose from, and some cost less than $10 a month. A free FTP program that you can use to upload your eBook onto your site is FileZilla. If you follow these five simple steps, you can create an eBook in very little time. Soon these steps will become second nature as you create your eBooks. 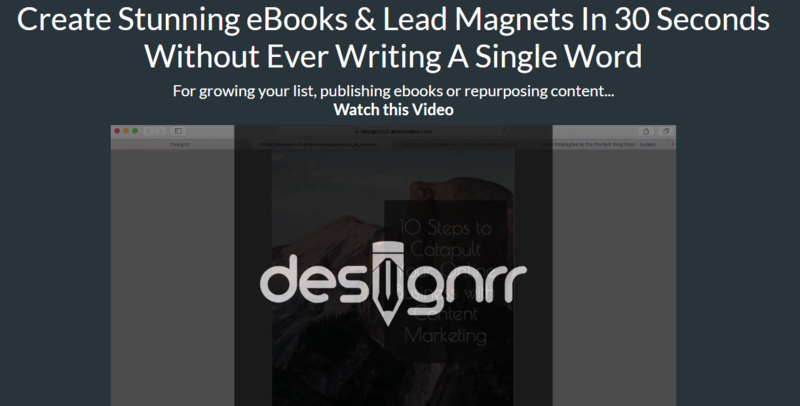 Watch a video demo of how to create an ebook by Designrr below.